These days I spend way too much time in my car. And I’d like to make that time at least a bit more useful. 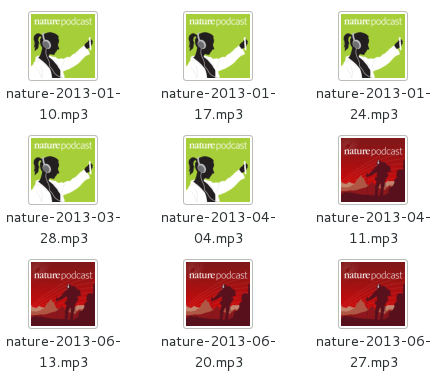 So I listen to podcasts. However, downloading all these podcasts can also take a lot of time, especially when you want to download an entire archive. Using Linux, it only takes one simple little script to do it. This is the basic for-each loop. For each item in <list>, do <command>. Retrieve the page (in this case http://www.nature.com/nature/podcast/archive.html) silently. However, it will still output the page to the standard output stream, which is what we want. Match the pattern starting with “http”, and ending with “.mp3”. The -o switch will only show the part matching the pattern, the -i will ignore the case, and the -e indicates the pattern will follow. These two are combined, because they are basically self explanatory: “sort” sorts the list, “uniq” will remove duplicates from the list. This just prints the URL of the file to retrieve.